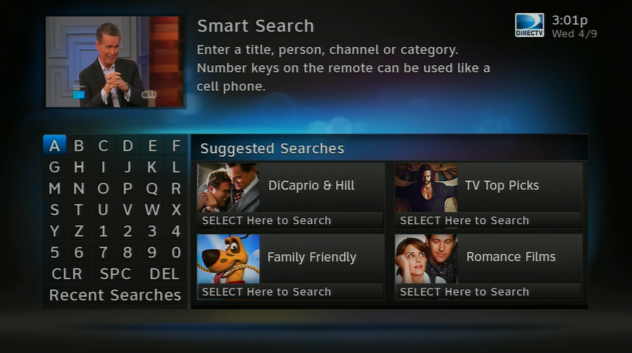 DIRECTV Smart Search is smarter than you think! DIRECTV’s Smart Search is pretty gosh darn smart. Just put in some part of the show you want and it will find it. There are a few tips you didn’t know about, though, and they’re worth a quick look. Looking for The Goldbergs? Don’t bother with T, H, or E, just start typing with G, O, and L and you’ll be in business! Were you a mad texter in the ’00s? Use your DIRECTV remote like you used to use a cell phone to text– press once for A, twice for B, three times for C, and four times for 2. Remember that drill? Still works. A keyword search will find the word you’re searching for anywhere in the title or description of a show. Looking for quilting? Type “quilting” and then press the RED button. If that word is anywhere you’ll see it. With DIRECTV’s free apps for smartphones and tablets (available through your device’s store) you can search with a real keyboard, find later showings, even set up series links so you’ll never miss your favorite programs! Searching for the stuff you want to watch on DIRECTV has never been easier, and now you have the power to make it happen! Do you need a new satellite system for your boat? Your choice: Genie or 3 HR24s? Should you get “DIRECTV Now” or stick with satellite service?